Nutra Forskolin is nothing but a nasty, celebrity click-bait scam … and you should stay away from it! In this review I’m going to expose this supposed weight loss supplement for the scam that it really is so make sure to carefully read it to the end! 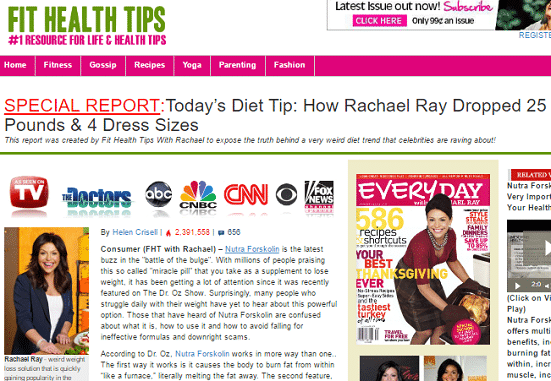 The first fake article is on a website called Fit Health Tips (link removed), which is allegedly owned by TV personality and celebrity cook Rachael Ray. It features Dr Oz allegedly claiming that Nutra Forskolin ’causes the body to burn fat from within “like a furnace,” literally melting the fat away.’ The article also featured a video of Oz supposedly demonstrating how Nutra Forskolin works. But in reality, he was promoting is own forskolin supplement in the video, NOT Nutra Forskolin. ‘Helen Crisell,’ the author of the article, goes on to claim that she tried Nutra Forskolin and lost 25 pounds in 4 weeks without any ‘special diet’ or ‘intense exercise.’ But the testimonial photos provided are all stolen, and the comments are fake. Oddly enough, each time you click on the order button, you’ll NOT see any Nutra Forskolin to order. Instead, you’ll be redirected to websites like Exclusive Forskolin, Forskolin Diet Secret, etc. Finally, there is a disclaimer at the bottom of the page stating that the article is fake. ‘THIS IS AN ADVERTISEMENT AND NOT AN ACTUAL NEWS ARTICLE, BLOG, OR CONSUMER PROTECTION UPDATE,’ states the disclaimer. What a scammy, deceptive advertisement, don’t you think? Moving on. The second fake article is supposedly by gossip website TMZ, and it’s about how country music star Blake Shelton used Nutra Forskolin to lose 30 pounds in one month. According to the article, it was Blake’s girlfriend Gwen Stefani who revealed the ‘secret’ when she appeared on Ellen DeGeneres’ show. Just as in the first article, the testimonial photos are stolen and the comments are fake. Also, when you click on the order button you won’t see any Nutra Forskolin to buy. Instead, you are redirected to sites such as Exclusive Forskolin, Forskolin Diet Secret, etc. Take a look at these sites, and you’ll quickly notice that they are the same. The only difference is that the label on the bottle is changed to match the website’s name. Unlike the first fake article, this article does NOT have any disclaimer. SUMMARY: Nutra Forskolin is a non-existent weight loss supplement which is being marketed using fake articles, stolen testimonial photos and celebrity names. Final Conclusion: DON’T BUY Nutra Forskolin. It’s A SCAM! I believe there are more clones of these websites. Alert me in the comments if you come across them so that they too will be included in the list. Please also note that this scam particularly targets U.S residents. Just as I mentioned in a previous review, Forskolin does NOT induce weight loss, but a semi-reliable study has shown that it has the potential of preventing rebound weight gain and boosting testosterone levels. Also note that this study was widely criticized for not being comprehensive enough as it involved only 15 obese men taking 250mg of 10% forskolin twice a day for 12 weeks. Not even a single woman was involved in the study so no one knows if forskolin causes weight loss in women. Bottom line: Forskolin for weight loss is still in its experimental stage. More research is needed before it can be prescribed for weight loss. 1. The Half Day Diet. This weight loss program by celebrity trainer Nate Miyaki shows you how you can lose weight by dieting in the day and eating all the carbs you want at night. Read my review first for more information. 2. Eat Stop Eat. This innovative program by Brad Pilon teaches how to properly implement intermittent fasting for healthy weight loss. Read my review for more details. 3. 21 Day Sugar Detox. This program by nutritionist Diane Sanfilippo is for those whose weight gain is caused by bad food cravings. Read my review for more details. These programs are not guaranteed to work for everyone, but they are high quality programs with a money back guarantee. So don’t be afraid of trying them. If you have used Nutra Forskolin or any of its clones, please share your experience with us in the comments section. For more information about this scam, check out Supplement Police’s review. Contra Health Scam removed the link to the fake website Fit Health Tips because it has been confirmed to be a phishing site.